Alternately: Your greatest enemy is your own unpreparedness. Feeling secure and letting your guard down is what makes you insecure. 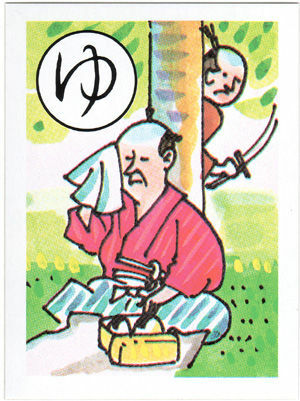 Notes: This yojijukugo is brought to my mind repeatedly by incidents that occur while we’re changing our baby’s diaper. Pro tip: even if a baby just peed, there’s no rule that says they won’t pee again! 油断 (yudan) is an interesting word. Although a kanji compound, it is apparently only used in Japan. The combination of “oil” and “cut” doesn’t intuitively lead to “unpreparedness” or “inattention.” There seem to be multiple etymologies floating around online. One of the more picturesque ones is the (super apocryphal) story of a king who commanded one of his retainers to carry a bowl of oil, with the admonition that if he spilled even a single drop it would cost him his life. Another possible source is the story of a temple that was maintaining a continually-lit flame; negligence in that case would literally be allowing the oil to run out. From this website, apparently part of a series of posts comparing the illustrations from various yojijukugo karuta card sets. This entry was posted in Japanese, Yojijukugo and tagged enemy, guard, preparedness, 大敵, 油断. Bookmark the permalink.